Now we get to the final grades which can generally be classified as “eye clean” when they’ve been carefully selected. I emphasize “carefully selected” because as you saw with the VS grades you’ve noted the greater variety and number of imperfections that can be found within the gemstone. When you get to the SI grade you increase the chances of having surface breaching inclusions (compromising structural integrity) as well as transparency in some cases too. 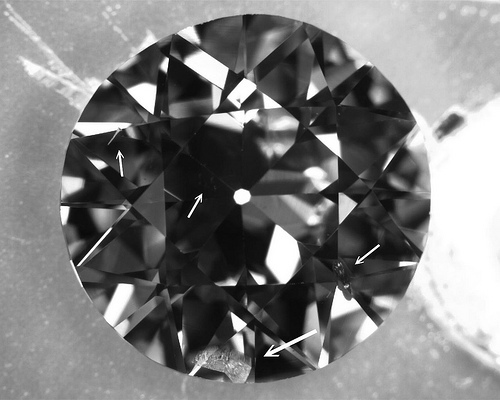 In the SI1 grade, the inclusions are described as “easy” to locate for a skilled grader under 10x magnification as opposed to “somewhat easy” in VS2 however with a nicely picked SI1 you can safely be with an eye clean diamond.  When buying an SI clarity diamond online, I would only recommend purchasing from a distributor who actually sees what it is they are selling you. 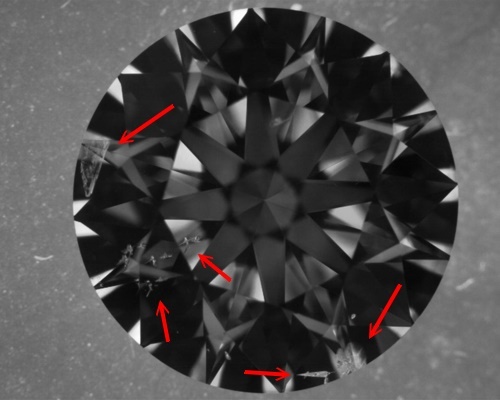 Most online vendors don't even see the diamond prior to the sale and won't be able to accurately determine how eye clean the diamond is, much less being able to perform a gemological inspection of the diamond for surface breaching inclusions or characteristics that can impact diamond transparency. Here are some good examples of SI1 clarity diamonds and what you can expect to see under a gemological microscope. Note the small feathers under the table which are white and translucent.  They would be considered "easy" for a skilled grader to locate and via our photomicrographs easy for you as well. Now... before you begin to assume that you'd see these with your eyes ... think again. This image below is of the same diamond, still under magnification but reduced to the size that is closer to 1 1/2 times its actual size. Turn on overhead lighting and you'll get the idea why I say SI1 clarity can be eye clean. microscopically small feathers at 8:00. The August Vintage Cushion (SI1) below has a small crystal and a feather under the table facet as well as a feather inclusion in the 9:00 position. 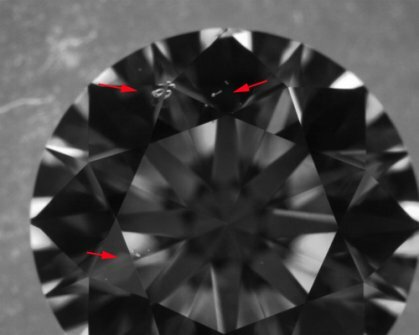 When it comes to diamond clarity, SI1 is generally the last clarity grade I consider "safe" when it comes to matters of being "eye clean" to the average layman not to mention passing that "mother in law" test. :) Oh yes ... you can't get a diamond that your future mother in law will see the inclusions upon inspection! Which brings us to the SI2 clarity grade. 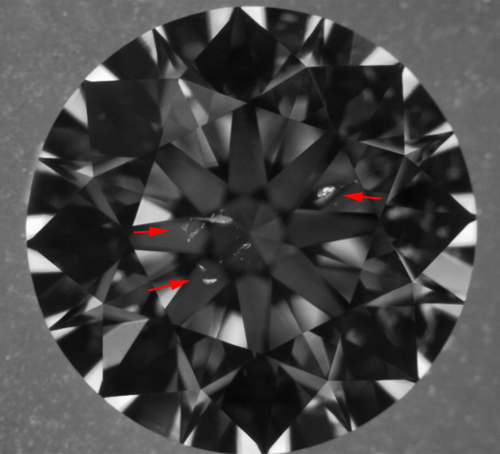 When we reach the SI2 grade the inclusions are now considered "very easy" to see by a skilled grader under 10x magnification. 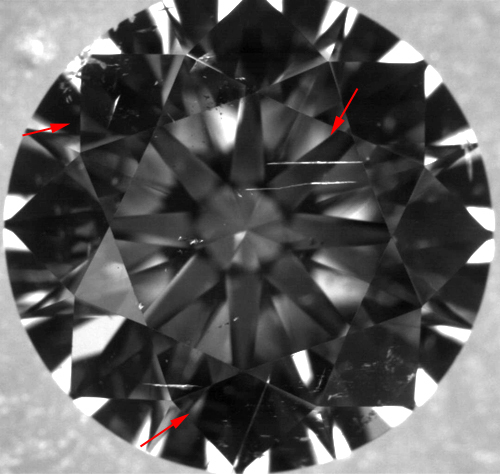 In smaller diamonds under 1ct they can generally be "eye clean" but once you hit 1ct and over there are many SI2's that are not eye clean. The larger the diamond the easier it is to "see" into the facets.  There are a number of factors that go into play when considering an "eye clean" diamond and I highly recommend you read my short tutorial on that subject here. Here are some examples of what you can expect to see under magnification when it comes to the SI2 clarity. 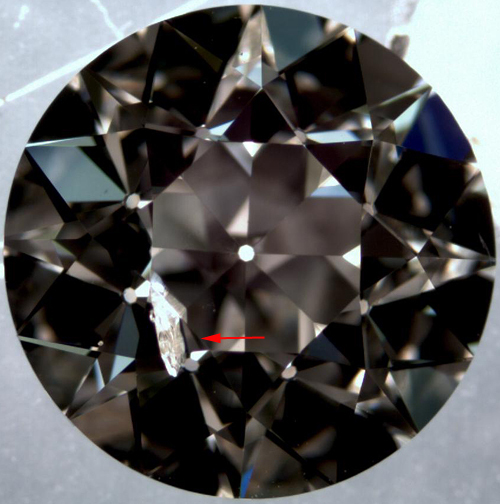 When examining SI2 clarity we generally find one of 2 varieties. 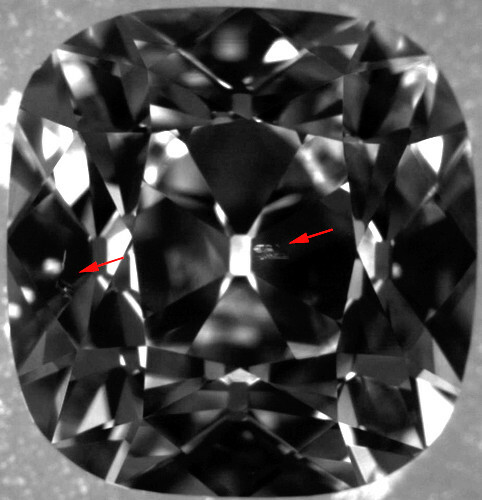 Those SI2's in which there is one larger inclusion making the SI2 grade vs the more/many smaller ones scattered throughout the diamond. In this first example we see an SI2 where the entire grading is wrapped up in one primary inclusion off to the side of the table facet. Here is a great example where they are of the 2nd type ... smaller, more translucent and scattered. Both diamonds happen to be good examples of "good" SI2's also. The reason I say this is because the primary grading inclusions are not under the table facet which is common in the SI2 grade like the example below. Here is another "good" SI2 in an OEC diamond with the primary grader at 6:00 and secondary feathers at 4:00, 10:00 and a small cloud under the table.